St. Lucy’s 20, Gladstone 5 — Grazia Watkins was the winning pitcher, Katie Greep and Kim Cortez each had five RBIs and a double and Gianna Ceccarelli went 3 for 4 with an RBI and a double to lead the Regents (7-5) to the Northview Tournament victory. Bishop Amat 9, Brea Olinda 2 — Alexis Vargas pitched a complete game, Alyssa Barrera had three hits and Julia Menrad had three RBIs to lead the Lancers (10-4) to the nonleague win. South Hills 8, Pelham (Alabama) 1 — Ryan Mauch pitched six innings, striking out seven and Francisco Ramirez went 3 for 5 with two RBIs and a home run to lead the Huskies (8-3) to advance to the IMG Academy Classic semifinals in Florida. For South Hills, Marcos Campos went 2 for 2 with two RBIs and Ryan Cohen had an RBI double. Bishop Amat 231, St. Paul 233 — Jason Gras shot a 4-over 36 for the Swordsmen (5-6, 1-2) but it was not enough to win the Del Rey League match at Santa Anita Golf Course. Donovan Delgado shot a 41 and David Rojo shot a 43 for the Lancers (7-2, 3-0). Diamond Bar 15, South Hills 3 — Teams of Daniel Chai and Roger Yang and Michael Tran and Nicholas Wong swept in doubles to lead the Brahmas (5-2) to their first Palomares League win of the season. LA HABRA — Bonita High School usually doesn’t beat itself, and the Bearcats lived up to their reputation Tuesday. A.J. Woodall tossed a four-hitter and Bonita took advantage of two Sonora miscues to score a 3-1 victory over the host Raiders in an Anaheim Lions Tournament game at Anderson Field. Jarret Lindsay also had a RBI single for the Bearcats, who improved to 11-3. Gabe Armstrong had a home run for Sonora, which slipped to 8-6-1. The Raiders were denied a chance at possibly tying the game in the seventh when Bonita center fielder Danny Gelalich threw out the Raiders’ JonPaul Sarro at third to end the game. 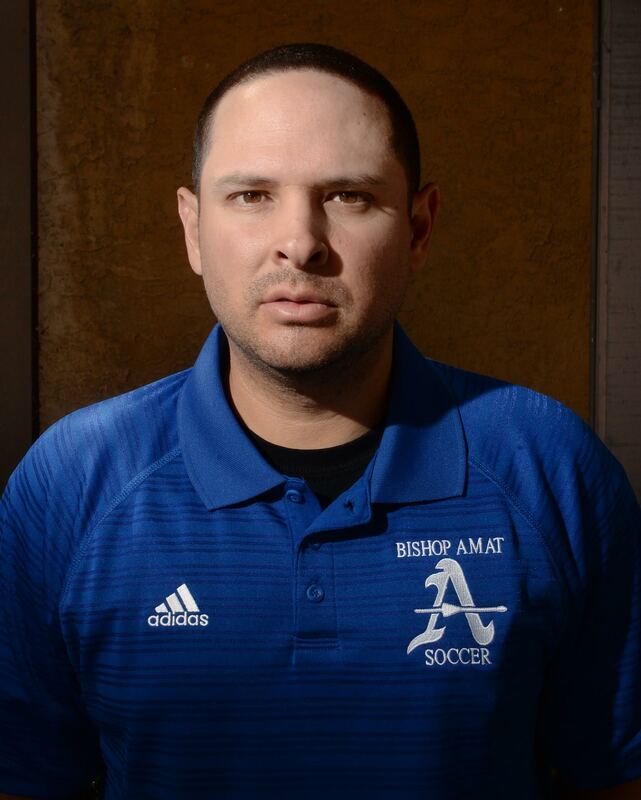 Amat played in arguably one of the toughest leagues in the CIF-Southern Section, battling eventual divisional and state champion Cathedral, who is also the mythical overall state champion for Top Drawer Soccer, which also ranked Cathedral fifth in the country. 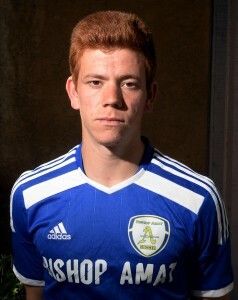 DiFiori, who finished with a modest seven goals and six assists, was a finalist for player of the year in the Del Rey, which eventually went to Cathedral’s Saul Reyes. But the respect shown to DiFiori, who had a goal and assist in a 4-4 tie against Cathedral, shows what his value was to a Lancers’ team who had one of their best seasons in recent memory, finishing second to Cathedral with a 12-2-4 overall record before bowing out to eventual semifinalist Pasadena in the Division 3 playoffs. For his effort, the Del Rey first-team selection has been named the San Gabriel Valley Tribune boys soccer player of the year for 2014-15. The Lancers struggled in recent years just to stay above .500 and were rarely discussed when ranking the area’s best teams, but they showed they were not only in the discussion this season, but arguably the top team around. The Lancers boasted the area’s biggest result, a 4-4 tie against powerful Cathedral in the Del Rey League and a sweep over Salesian, which led to a second-place finish in the Del Rey, which is arguably one of the toughest in the section. 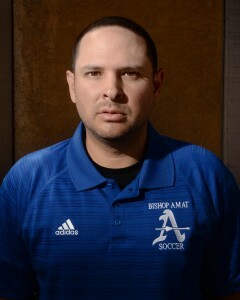 Bishop Amat finished 12-2-4, losing only to Cathedral in a second meeting for the league title and to eventual CIF-SS Division 3 semifinalist Pasadena. 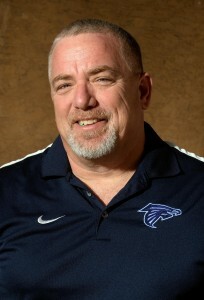 For his efforts, Gonzalez has been named the San Gabriel Valley Tribune boys soccer coach of the year for the 2014-15 season. 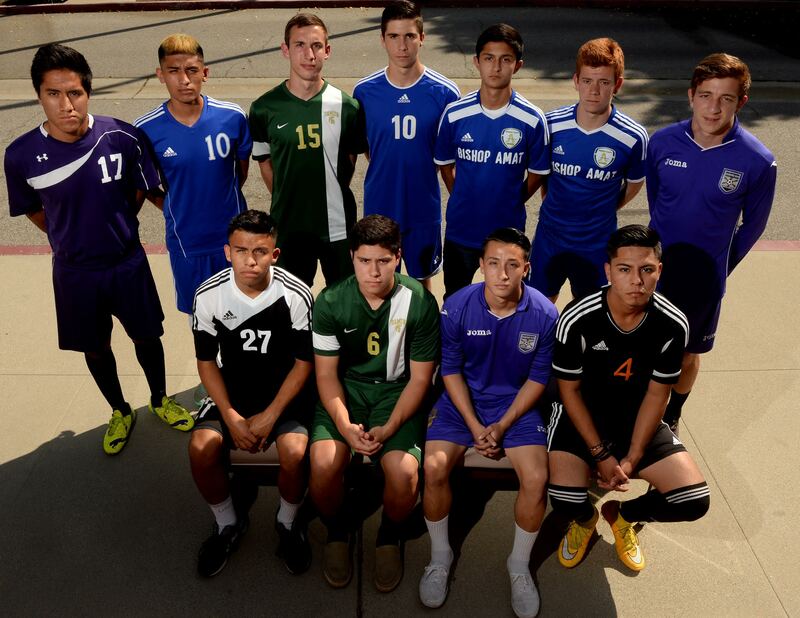 Defender: Tim Ebiner, Damien, Sr.
Defender: Adrian Garcia, Mountain View, Sr. Forward: Federico Hurtado, Charter Oak, Sr. Forward: Sebastian Ocampo, Sierra Vista, Sr.
Chino 9, Buena Park 1 — Kenny Meza pitched five innings with one earned run, Mike Guerrero went 3 for 4 with four RBIs, a double and a triple and Cesar Sandoval went 3 for 3 with three doubles to lead the Cowboys (7-4) to the Anaheim Lions Tournament win. Hewitt 3, South Hills 2 — Gabe Chavez had a double and an RBI and John Dearth had a single for the Huskies (7-3) in a Florida IMG Academy Classic loss. Ryan Cohen and Francisco Ramirez each had a stolen base for South Hills. Gladstone 9, Edgewood 6 — Eric Albarran pitched six innings, striking out three, Martin Tapia went 2 for 3 with two RBIs and Juan Cervantes had three RBIs and a double to lead the Gladiators (5-3) to the Jim Graham Memorial Tournament win. Nogales 11, Southland Christian 1 — Lisette Rosales went 3 for 3 with two doubles and Juliana Purcell had two doubles for the Nobles (10-3) in a nonleague win. St. Lucy’s 5, Covina 0 — Dakota Casper was the winning pitcher, she also had a double and an RBI and Katie Greep went 3 for 3 with two RBIs for the Regents (6-5) in a Northview Tournament victory. Carly Pina had a home run and two RBIs and Emily Sierra had a double for St. Lucy’s. WHITTIER — Bishop Amat High School, after being swept by rival St. Paul last season, waited nearly a year for redemption against the Swordsmen. The Lancers didn’t waste the opportunity Monday. Alyssa Barrera and Julia Menrad had three RBIs each and Bishop Amat enacted some sweet revenge with an 11-3 victory over St. Paul in a Del Rey League softball game at York Field. Menrad and Barrera also hit home runs for the Lancers, who took over first place at 9-4 overall and 3-0 in league play. Niko Walker had two hits and Taylor Fogle a two-run triple for the Swordsmen, who slipped to 11-6 and 3-1. Top (left to right): Skylar Robledo (South Hills), Hailey Zerbel (South Hills), Jamie Peters (Bishop Amat), Danielle Herrera (Bishop Amat), Hanna Armendariz (Bishop Amat), Nicole Leggio (St. Lucy’s), Taylor Salgado (Charter Oak). 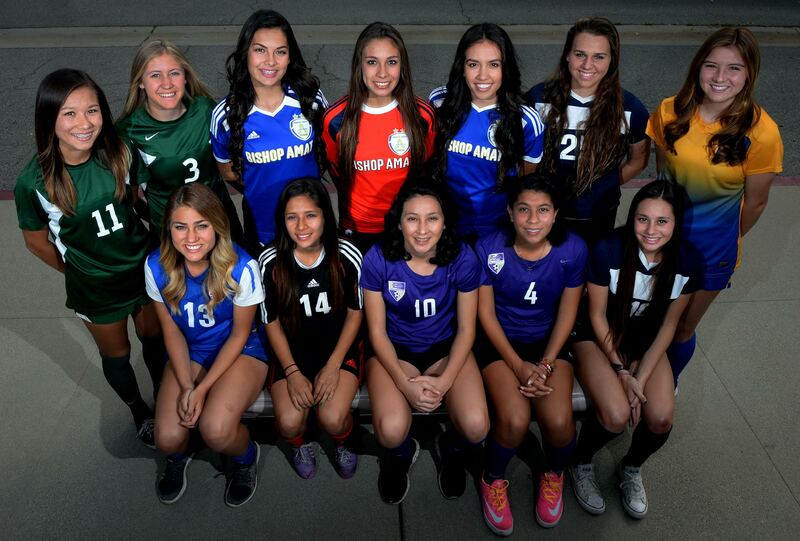 Bottom (left to right): Jazzmyn Esquivel (Los Altos), Maria Hernandez (Sierra Vista), Marissa Favela (Diamond Bar), Mia Trugerrio (Diamond Bar), Julia Bingham (St. Lucy’s). The crafty midfielder did everything for the Lancers girls soccer team, finishing with an area-best 30 goals to go with 15 assists in helping her team to the Del Rey League title. Armendariz, who is headed to the University of Portland on a soccer scholarship, was named the Del Rey League player of the year and also was selected to the CIF-Southern Section Division 3 first team. For her efforts and outstanding season, Armendariz also has been selected the San Gabriel Valley Tribune 2014-15 girls soccer player of the year. 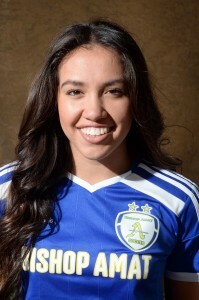 Armendariz had four games with three or more goals, including a four-goal performance against St. Matthias Academy. Armendariz, who won a CIF title with the Lancers as a sophomore, helped them reach the quarterfinals and also an at–large berth in the state playoffs. The Falcons finally closed the gap on Sierra Vista’s dominance in the Montview league, snapping the Dons’ 65-game league winning streak with a 3-2 victory. Sierra Vista won the rematch in the league finale 1-0 in overtime to claim the league title, but the Falcons finished 13-6-1 and won a CIF-SS divisional playoff game to finish its best season in history. It was quite a turnaround after going 10-9-2 last year and 8-10-2 in 2013. Chino 8, Diamond Ranch 0 — Josh Thornton threw a complete-game shutout with five hits and five strikeouts for Chino. Jonathan Alba, Cesar Sandoval, and Mike Guerrero each had two hits for Chino. 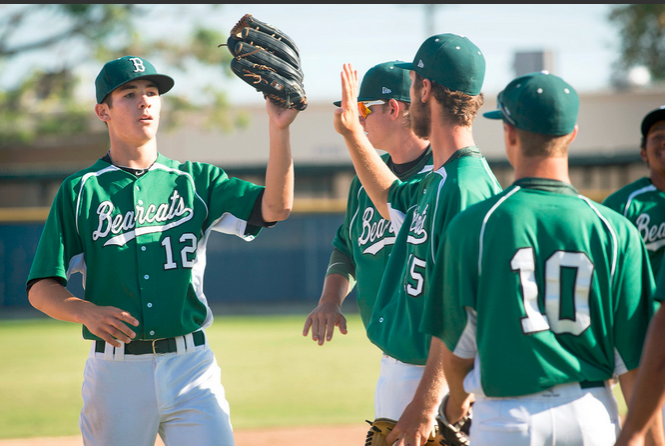 Bonita 1, Claremont 0 — Isaiah Haro tossed a complete-game shutout to put the Bearcats (7-3, 2-1) in a four-way tie for first place in the Palomares League. The senior struck out three batters and allowed just three hits after carrying a perfect game into the sixth inning. Alex Gonzalez scored the team’s only run reaching base on a single. He then stole second base and advanced to third on a deep fly ball by Justin Gomez. Then a blooper by Kenji Henderson over the third baseman drove in the game’s only run.